Sami M.M. Abdallah (born July 30, 1991) is an R&D chemist and product developer. He received his BSc in Chemical Engineering degree from the American University of Sharjah in the U.A.E., and proceeded to earn his MSc in Advanced Chemical and Process Engineering degree from the University of Strathclyde in Glasgow, Scotland. 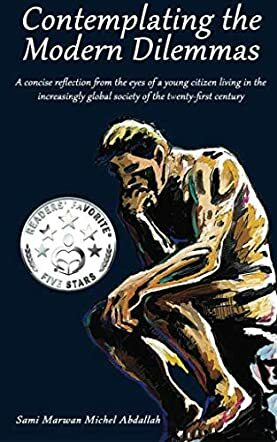 The sub-title of Contemplating the Modern Dilemmas by Sami Marwan Michel Abdallah captures the essence of the book succinctly —a concise reflection through the eyes of a young citizen living in the increasingly global society of the twenty-first century. In these pages, readers encounter a young mind rethinking critical and philosophical questions in the context of a contemporary lifestyle. While the style and thought formulation might not be classic, there are beautiful reflections and questions that will have serious readers and lovers of philosophy thinking about morality, life, and personal development. The author provides answers to questions like: When can we be absolutely sure of the path we have chosen? What makes an action right or wrong, and who defines the parameters of morality? Such are the questions treated in these essays and many more. The style is simple while keeping to a standard academic format. Readers will enjoy references to ancient and modern thinkers. I enjoyed the allusions to Aristotle and his Nicomachean Ethics. The reader gets the feeling that they aren’t just pondering on thoughts from a young mind, but critical interpretations of concepts and how they are applicable to contemporary life. The author draws a clear dichotomy between life in the past and our technologically advanced age, rethinking values in a world where the line between good and evil, right and wrong gets grayer by the day. There are beautiful reflections on personal growth in this book and readers seeking meaning and a path towards success will find a lot of wisdom in it. For instance, speaking on choice and on pursuing profitable work that aligns with our core values and that drives success, the author proposes that the individual should ask four fundamental questions: What is my goal? What drives me to such an undertaking? What are my options? What are the consequences of each option? Sami Marwan Michel Abdallah’s Contemplating the Modern Dilemmas is a beautiful gift that will help readers rediscover the lost art of critical thinking and approach life from a rigorous attitude of mind. It will teach you to set and adhere to principles.